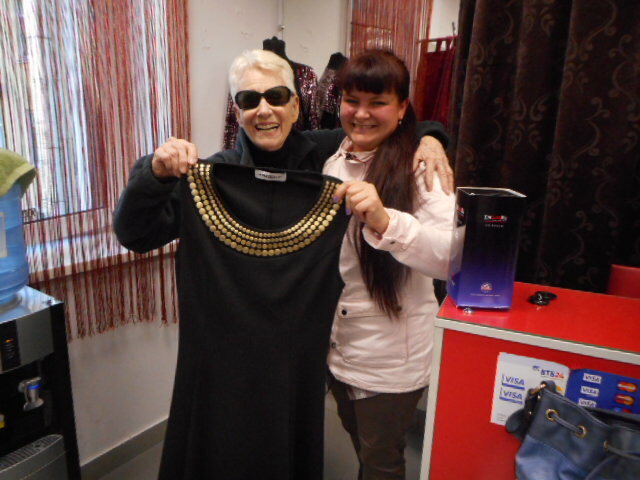 I like clothes and it was my birthday, after all; so when I saw a darling dress in a cute little store in Archangelsk, Russia, I snapped it up the afternoon before I flew to Moscow. Instead of taking it out of the shopping bag and figuring how in the world I was going to stuff it into my suitcase; I simply took a nap, and didn’t address my last-minute packing until after five in the afternoon. OH. MY. GOD! The anti-theft device was still firmly attached! Well, the store clerk, Lee, and I had gotten to talking rapidly, even though we had no common language….. but now what? It was so late that I was sure her store was closed by then. 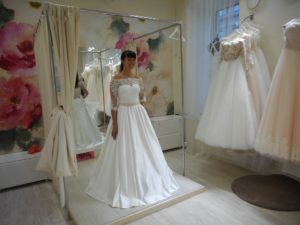 Maybe, the nearby bridal store could get it off? Oh, this must be the receipt, which I had yanked off when removing it from the bag! Nope, they didn’t have the right equipment! Look at this gorgeous place! They tried to help but don’t use anti-theft devices. Who’s going to slip one of these dresses out in their purse? And anyway, my receipt was for boots, not a dress! Oh no! I did buy boots earlier in the week…. black beauties…..You see, I’m thinking ahead to my mid-October World Congress of the Hearing Voices Network Conference in Paris, at which I will be teaching a workshop. Gotta’ dress right for that city! I ran back to my room and found the correct receipt in the wastebasket. How was I to know? I can’t read Russian. Any other day during my stay, I could have simply gone in the next day and had Lee remove the plastic warning device; but I needed to taxi to the airport early the next morning. I ran the three blocks from the Troika Hostel to the mall and found the store CLOSED! Yoiks, what now? 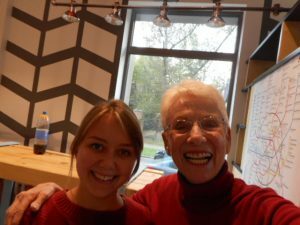 Roman Baranov, proprietor of the body-building store next door to the clothing shop, and speaker of English, became my new best friend. 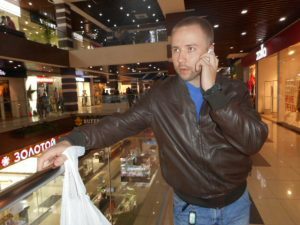 After calling his mall-manager about the closed shop, he shut his own store and we ran together an additional three blocks to another swishy mall. By now, it was getting so funny and desperate, that I began a photo story. Three stores in a row, heroically used their little machines to remove this strange anti-theft device and I soon learned that the buggers are specifically programmed for each store and theirs didn’t work. But they pounded and stabbed with sharp objects, hoping to break its lock. I worried about the dress fabric getting slashed, but couldn’t complain. They put heart and soul into trying. Roman and the first store clerk, tackling my dress. Luckily, I had the proper receipt, or I couldn’t have proven that I didn’t steal it. Such a beautiful little black dress. Form-fitting with metal decoration on the scoop neckline. Swish! But not with this alarm attached! 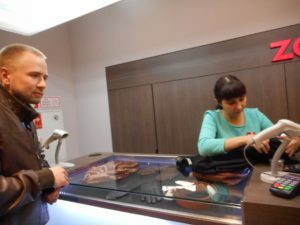 We tried a second shop…. She took to beating on it. We ran to a third clothing shop…..no luck! The owner of the shop where I bought it, had rushed in; but, she had lots of trouble too. The poor device was all beat-up, but the dress was okay. 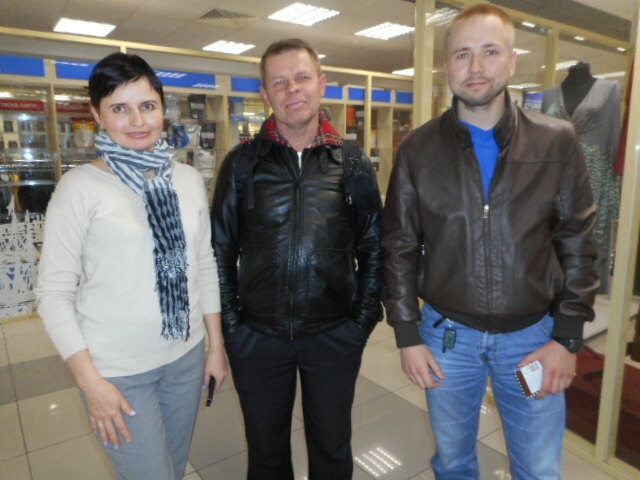 By now, other shop owners, Svetlana and Andre, had gotten involved helping Roman help me. Yay! Success, at last! 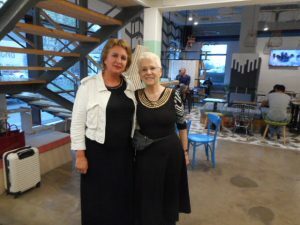 I can fly to Moscow with a wearable new dress…. 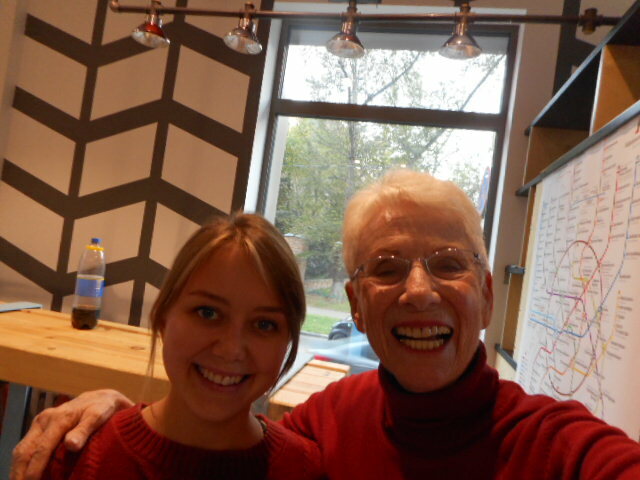 and lot’s of darling new friends in Archangelsk. Plus, I have such a great story to tell, that it was all worth it. The only frustrating thing, was when I returned to my hostel, I couldn’t find anybody to understand what I was babbling and giggling about in my English and total lack of Russian. Many, many Russians do speak English, and finally one of them came to translate, but just that moment, they were all male business men and very keen to hear the joke that I was so keen to share! However, everything works out in the long run, if only we will all TRUST THE PROCESS! Usually the worst things that happen, yield the Best Stories and the Best Friends. And, here I am, wearing that very dress in Moscow with another hosteler who also likes little black dresses with gold at the neckline. 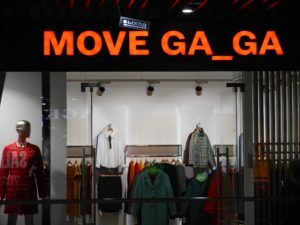 One of the shops was named Ga Ga, which is my own nickname used by my grandchildren. It seemed to be telling me something! 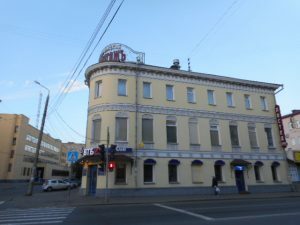 My Hostel Troika in Archangelsk, Russia. I met Karina Simakova at that hostel. We met up again, twice, in Moscow.